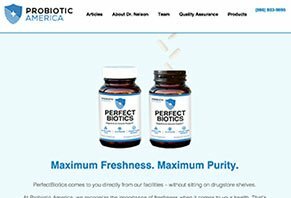 Perfect Biotics by Probiotic America Reviews - Is it a Scam or Legit? Probiotic America’s Perfect Biotics is a probiotic supplement that’s claimed to help reduce gas and bloating, increase energy, boost metabolism, and more. Manufactured by Probiotic America, Perfect Biotics is a digestive health supplement that’s claimed to designed around “the latest scientific research and cutting-edge technology” to help relieve your chronic fatigue, gas, and bloating. According to the Probiotic America website, Perfect Biotics is formulated around providing users with an 80/20 “gut equilibrium” between good and bad bacteria, so that you’ll experience increased energy, improved metabolism, and many other digestive benefits. In addition, when compared to the competition, Probiotic America’s claims to raise their bacteria cultures in a Wisconsin laboratory, encapsulate and third-party test it in Utah, and then test it a third time upon arriving at the company’s distribution center in Southern California. And because they’re cutting out the middlemen—and the length of time spent on store shelves, Perfect Biotics is claimed to arrive at your door with maximum freshness and maximum purity. What Ingredients Does Probiotic America’s Perfect Biotics Contain? Lactobacillus Salivarius – Claimed to protect against cavities and gingivitis. Lactobacillus Casei – May help inhibit the inflammatory response. Lactobacillus Plantarum – Possibly helps heal injuries. Bifidobacterium Infantis – May help improve your immune system. Bifidobacterium Bifidum – Can help prevent the overgrowth of candida (yeast). Lactococcus Lactis – Helps metabolize (break down) carbohydrates. Lactobacillus Paracasei – May help relieve symptoms associated with atopic dermatitis (eczema). Streptococcus Thermophilus – Possibly helps fight respiratory infections. Lactobacillus Acidophilus – May help reduce blood pressure and cholesterol levels. Bifidobacterium Breve – Can reduce gas and other bowel, stomach, and intestine irritation. Lactobacillus Brevis – May help prevent kidney stones. Bifidobacterium Lactis – Can improve digestive comfort. Perfect Biotics is claimed to be made in the USA in a GMP facility, without soy, lactose, or gluten. According to the company, most users notice a difference after 4-6 weeks of regular use. Do Probiotics Provide Any Health Benefits? Before discussing Perfect Biotics specifically, it’s important to note that for the most part, probiotics have a fairly large amount of clinical data showing them to be effective for numerous conditions. These include reducing irritable bowel syndrome symptoms (as well as gas and bloating), increased immune system response, decreased allergic responses, and much more. For an in-depth look at probiotics and their benefits, be sure to read through our article titled Everything You Wanted to Know About Probiotics, but Didn’t Know to Ask. Are Perfect Biotics’s Ingredients Effective? With this said, even though lactobacillus and bifidobacteria have been shown to provide some benefits for the majority of people who use them, this doesn’t necessarily mean your health will significantly be improved, or that you’ll experience everything claimed by Probiotic America. For example, although one of Perfect Biotics’s claimed benefits is increased carbohydrate metabolization, this doesn’t mean you’ll be able to eat all the bread you want, or that you’ll lose weight if you don’t. Also, although one study may have shown some probiotic strains could help promote healing, this doesn’t mean you’ll experience a noticeable reduction in healing time if you were to sustain a severe injury tomorrow. In short, you’re much more likely to experience relief from constipation, gas, bloating, and other types of digestive upset, and possibly from eczema, using probiotics (Perfect Biotics or otherwise) than you are some of the others claimed on the supplement’s website. Perhaps because of the benefits experienced by so many users, probiotics such as Perfect Biotics have flooded the market over the past couple years, including other popular options such as ProbioSlim, Whole Body Keybiotics, Essential Cultures, and many more. The point is that you have a wide variety of options from which to choose, so it’s important that you research several probiotics before handing over your hard-earned money (HighYa is a great place to start!). With this said, many of Probiotic America’s competitors manufacture supplements with 10 million (or more) bacteria CFUs, so Perfect Biotics isn’t necessarily the most powerful available (important note: Perfect Biotics from Probiotic America does not appear to be related in any way to PerfectBiotics from Perfect Origins). Does Probiotic America Cause Any Side Effects? According to WebMD, most people who take probiotics do not experience any side effects, and those that do are generally mild. These include digestive upset, bloating, or gas, although these should subside within a couple days as your body adjusts to the increased bacteria levels. Are Customers Finding Relief with Probiotic America? Perfect Biotics is manufactured by Probiotic America, LLC based out of Woodland Hills, CA. The company appears to be very new, as their trademark was filed in October 2014 and their website URL was registered in January 2015. As such, Probiotic America wasn’t listed with the Better Business Bureau at the time of our research, and no online customer reviews were available. However, more than 200 HighYa readers have provided feedback on the popular probiotics noted above, and gave them an average rating of almost 4 stars. Common compliments included reduced gas and bloating, increased regularity, and an improved metabolism. On the other hand, the most common complaint was failure to work. Granted, this may not be what you’ll experience with Probiotic America’s supplement, but it’s always helpful to know what consumers are saying about the competition. Note: According to Probiotic America’s Terms & Conditions, an autoship program is available that provides regular shipments (once per month) of Perfect Biotics to your door. However, we were not presented with an autoship option when checking out, and no additional information is provided on the supplement’s website. All Probiotic America purchases come with a 90-day refund policy, although you will be required to send the empty bottles back to the manufacturer. In order to request a refund or cancel your autoship enrollment, you’ll need to contact customer service at (866) 803-9895. What’s Different Between Perfect Biotics & Perfect Digest? By taking one capsule daily, Perfect Digest claims to help breakdown food and support healthy digestion, leading to reduced gas and bloating, along with increased nutrient absorption from food. Is there any evidence these enzymes will accomplish this? First, enzymes digest food by attaching themselves to particles and breaking them down so that you’re body can absorb the nutrients they contain. To this extent, different enzymes are responsible for breaking down different kinds of food; amylase for carbohydrates, bacterial protease for proteins, lactase for milk products, lipase for absorbing fat, and so forth. For example, do you have a pancreatic insufficiency? Lactose intolerance? A high fiber diet? In any of the instances, taking specific enzymes could aid in the digestion process. But overall, there’s a lack of clinical evidence showing that general enzyme supplementation can reliably provide improved digestion in all individuals. Who is Dr. Cary Nelson? Dr. Cary Nelson is a board certified physician who graduated from the University of Guadalajara in 2000, and who has specialized in family medicine and aesthetic medicine for the past 12 years. In that time, Dr. Nelson has been the recipient of numerous awards, including a Patients’ Choice Award five years in a row, a Top 10 Doctor in the city of Torrance, and more. Today, Dr, Nelson uses his training in laser techniques, skin rejuvenation, and anti-aging to help his patients achieve the look their desire. Because of this, most patients seem pleased with the care he provides, whether at his South Bay Family Medical Group practice or at Torrance Memorial Medical Center. It wasn’t until he was an adult that Dr. Nelson began supplementing his diet with probiotics, which he claims opened his eyes, improved his digestion, and turned him into a much happier and healthier person. Now, with Probiotic America, he’s able to focus on formulating “cutting edge probiotic supplements” based on “the latest nutritional breakthroughs” that could very well help you bring your digestive system back into balance. After all, like Dr. Nelson, you might not even realize that you’re suffering in the first place! Should You Purchase Probiotic America’s Supplement? Chopping to the Point: Overall, probiotics have helped millions of people find relief from a variety of “gut” issues, including gas, bloating, IBS, diarrhea, and much more. Because of this, many of the strains contained in Probiotic America could possibly help you experience the same. However, it’s important that you put your expectations into perspective. In other words, if you think taking Perfect Biotics will automatically send your immune system through the roof; that your stomach problems will be a thing of the past; or that you’ll have perfect oral health, you’re bound to be disappointed. On the other hand, if you want relief from mild to moderate bloating and gassiness, probiotics such as Perfect Biotics may help. Just be sure to speak with your physician first. Finally, because there are so many probiotics from which you can choose, including multiple ones at your local pharmacy—many of which are priced lower than Perfect Biotics, you might want to search near your home first. And don’t worry; many modern probiotics manufacturers include proprietary technology to ensure your bottle contains the maximum number of CFUs, regardless of how long it’s been sitting on a store shelf. I have been taking Perfect Biotics for one month and 3 weeks (1 pill a day with breakfast), and I have noticed several improvements. No more bloating, no more constipation, no more feeling overstuffed after eating a small meal. For most of my adult life, I haven't burned calories like most people do, despite the fact that I eat a healthy low-fat diet with very few treats, and I'm physically fit and active. I've never been able to eat normally without gaining weight, and in the past 4 years I've been forced to eat half-portions and absolutely eliminate any eating in between meals in order to keep my weight down. I've also consumed diet drinks which contain aspartame for years. I was frequently bloated and puffy, and after a meal I felt miserably over-full. Plus, my chronic constipation made things even worse. I might add that I have been very bitter about this – life is not fair! However, after taking Perfect Biotics for almost 2 months, the bloating and constipation are gone. I've lost that miserable feeling of being over-stuffed after a meal, and I've actually eaten a couple of normal-sized meals this past week, without any bad effects. (I've also stopped drinking diet drinks with aspartame.) I'm still going to eat meals with small portions, but I will no longer feel guilty if I indulge once in a while. My weight has stayed low, and I feel much better about myself. Plus there was a surprise benefit. I have tendonitis in the hamstring and in the thumb which is accompanied by inflammation and pain. 2 weeks ago, the pain almost disappeared, and the inflammation is way down. I don't know if the Perfect Biotics are responsible for this, but aside from giving up aspartame products, I've made no other changes which might explain the improvement. My only question is: How long do I need to take these pills? Once the good bacteria have been restored to my system, will it stay that way without the pills? If I continue to take the pills, will I overload my system with good bacteria? To sum up, I'm very glad I've taken Perfect Biotics, because my life is much more normal and comfortable. Hmm, I am wondering how much they paid you for this phony review? I am a consumer who posts both positive and negative reviews of products. I'm pleased to say that Perfect Biotics (30-billion CFU's, distributed by Probiotic America,) has been a life saver for me, and that within a week of taking the daily pill my IBS symptoms ceased and my digestive issues no longer became a source of worry and shame. After suffering for ten years with discomfort and embarrassment, I can now live a normal life again. This is my third month taking the probiotic pill, along with a morning sprinkle of psyllium on my cereal, and minimal coffee (as the company's Dr. Nelson suggests in his video), and I feel like a new person. I bought some for a friend and my daughter. I have no ties to this company and only learned about the product when I was searching the Internet for an answer to my chronic problem. My doctor and a physical therapist friend had said just days before I ordered the product that I shouldn't give up on taking probiotics to lessen the severity of my IBS. Previously, the probiotics I had taken didn't do much, so I stopped taking them, Thank goodness I gave probiotics another try -- and that I stumbled on Dr. Nelson's video touting Perfect Biotics. What a gift! I just ordered one bottle of Probiotics and was billed $208.00. I have been trying to reach someone through customer service, and have been unsuccessful. I've called Perfect Orgins, and Dr. Nelson, along with sending him a personal email asking for a refund. No one answered my calls nor have they responded to my emails. I think this company is a hoax, and plan to take legal action. I don't quite know how this can be, but there appears to be 2 different companies with a similar product and the exact same name. I watched an online video for this product, ordered, and received the other day the liquid product from Perfect Orgins called Perfect Biotics. After doing so, I went back to the internet and found another advertisement video for a similar product in pill form from the company referenced by Molly, Probiotic America. So she is actually reviewing the wrong product. Unless these two companies are one in the same, I'm pretty sure there is going to be a lawsuit. I take pills, not a liquid and the pills have worked for me. The bottle, which lasts a month, costs $40. Wow I don't know what number people are calling. I called 866-803-9895. I received a quick connection with customer service, pleasant friendly and not some automated robot or foreigner that still has not learned the language (ENGLISH). Ordered 3 bottles and like everyone else was offered a special price for 6 bottles so I agreed but the original order was not canceled. Customer service said that the order should have only been for the 6 bottles not nine, but that nine had been packaged. I was then told to keep all nine bottles and my account credited back for the 3 bottle purchase and my shipment upgraded free to 2 day priority for no extra charge. It's the simple human touch that makes all the difference. Bravo Probiotic America for your excellence in dealing with and correcting a small misunderstanding. Left me with the perfect willingness to deal with this company in any future endeavors. I was scared to take a probiotic that was advertised as being so potent. Other probiotics have given me painful gas, so I stopped taking them. This worked well with my system, and I even started to experience yeast "die-off" (brief flare-up of symptoms, followed by disappearance) after about 2 weeks. I just ordered another bottle. As promised, everything works best if you follow the plan and reduce or eliminate sugar and alcohol prior to starting, and take it with food every morning. I had just finished a Purium cleanse a month before and had eliminated sugar, alcohol, and coffee, so I was ready to go. If you really want to see a difference in your health, you need to approach it from all sides. This isn't a magic pill, it's a probiotic. It is legit. All the reviewers who bash the company for sending extra bottles or charging them more are ding-dongs. Read before you click. After you choose the amount you want, there will be at least 2 additional screens that will pop up with add-on offers. Just say no if you don't want to add on, you'll only be charged for the order you place. Hey Sarah! This is Lorelai with Probiotic America. I wanted to take the time to thank you for your awesome and honest review! We love hearing from our customers daily and learning about their story with our Probiotic. I hope that Perfect Biotics continues working well for you. If you ever have any questions or comments feel free to email me at Lorelai@probioticamerica.com. I have been using Perfect Biotics for almost 2 months. I love how they have made me feel energized. I recommend them to everyone. I suffered with gas and bloating daily after eating, I was taking GasX twice a day. Since using Perfect Probiotics, I no longer suffer with gas and bloating, I no longer have to take GasX. This has been a great relief to me. I think you are on to something good. This is a very good product. Since I started taking this product I have far more energy. My system is much easier and regular with no side effects. I also consulted my doctor who advised me use it. I look forward to staying with this product. Because I had never tried any products from this company before, I was hesitant to purchase more than one bottle. However, after completing my first bottle, I can say that I am much more tolerant of foods that had previously caused me issues and I just feel better digestive wise. I have had repeated bouts of h pylori, that was my main reason for seeking a good performing probiotic formula. I do believe their formula fits the bill. My only problem was that I could not get the capsule down intact so, I have to open it up, and take it with applesauce at breakfast time but I'm okay with that. Hey LaGwanda, my name Is Lorelai with Probiotic America. I wanted to thank you for such an awesome review! Also, as you have never tried any Probiotic America products, I wanted to welcome you to the family. My email is lorelai@probioticamerica.com, please feel free to shoot me an email if you ever have any questions or comments about our products or brand! I will be your personal gateway to all of the most commonly asked questions and answers if you need! Take care. I've had my cancerous thyroid and my gall bladder removed. Needless to say, this causes tummy troubles. I started taking this Perfect Biotics/30 billionCFUs and I feel like new person, no bloating, no more pain and I have become a normal bathroom user. No more looking for bathrooms while I am out for dinner. Thank you for giving me the information that I needed to live a normal life again. I am just finishing my second month using this Probiotic and so far, so good! I feel that I am having better results from this formula (less cramping, less bloating, less gas, more normal bowel movements) than with Align which I had been taking for several years. I am somewhat confused, however, as to the most recent emails I received announcing a supplement to this probiotic (unless I have gotten that wrong). Not really sure if it's just a new strain or if it is an additional product. I would not be interested in an additional product, if Probiotic America needs a supplement, perhaps a new strain would be in order instead? Hi Christine! My name is Lorelai with Probiotic America. I am thrilled to hear that you have been using our product for 2 months and are experiencing great results! In regard to the emails you are receiving about an additional supplement, Perfect Biotics+ is formulated with 9 additional strains specifically aimed to boost energy. Both of these supplements can be taken together to boost overall benefits. Of course, Perfect Biotics is just as great when taken alone. You will definitely see benefits from this formula regardless. Please feel free to contact me at lorelai@probioticamerica.com if you ever have any additional questions regarding our brand. I like that Probiotic America is lab grade and I take it with my protein fiber smoothie each morning for colon health. I was plagued by diverticulitis for 30 years and had to take strong antibiotics two weeks of every month for years and years to avoid hospitals and surgery. Since adding one Probiotic America capsule to my morning smoothie routine, I've not had any problems with my colon! It's made a huge positive difference in my overall health as well. I don't crave sugar and my mood is even. Hey Jan! My name is Lorelai contacting you on behalf of Probiotic America. I wanted to thank you for such an awesome review. I know how damaging antibiotics are and I am so happy to hear that Perfect Biotics helped reverse some of that damage. I hope you see even more beneficial results soon. Please contact me at lorelai@probioticamerica.com if you ever have any questions or comments. Write a Review for Probiotic America!